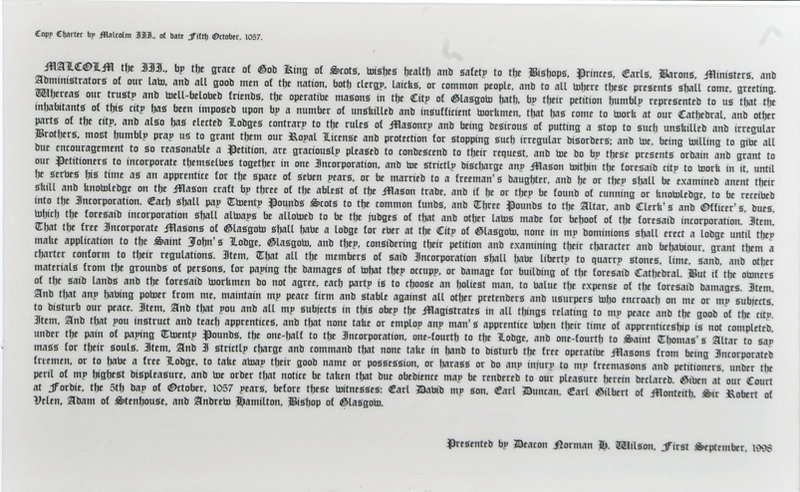 The aim of the website is to make available information to members of the Incorporation of Masons and to assist those who may be interested in genealogy to find information about ancestors who may have been Deacons, Clerks, Members or Deacon Conveners of the Trades House of Glasgow. The site also hosts images of prize winners at previous Deacon's Choosing Dinners. The Incorporation is delighted to supply speakers free of charge to any organisation that would like to hear a talk about the history of the Incorporation or the Trades House of Glasgow. Please feel free to contact us for more information. Free tours of the Trades House can also be organised for groups who would be interested in viewing this great and interesting building, please contact us to arrange a tour. Rules and bye laws of the Incorporation are hosted on the site and anyone wishing information about membership or to access application forms may do so with ease. https://www.facebook.com/Incorporation-of-Masons-Glasgow-974330949428097/ you do not have to join Facebook to view the material. THE INCORPORATION OF MASONS is NOT part of Freemasonry. The Incorporation has basically three objectives. 1. To support excellence in Stonemasonry and allied trades. 2. To offer help and financial support to individuals connected with the trades or the Incorporation where appropriate. 3. To offer charitable support to organisations and individuals primarily based in Glasgow. To achieve our aims it is important to recruit new members and if you would like to join the Incorporation and help us to achieve our aims, application forms can be obtained by CLICKING HERE. For information about costs etc. please CLICK HERE. For further details, please use the CONTACT US Page. Please be aware that you do not have to be a Tradesperson to join, all that we ask is that you wish to support those in the trades. It is important to be aware that the Incorporation of Mason's traditions are rooted in the Trades of Glasgow and not the Freemasons. Legend has it that the Incorporation was established to protect the stonemasons and the City of Glasgow from poor workmanship when Glasgow Cathedral was being built and King Malcolm the third in 1057 Incorporated the Masons of Glasgow, under Royal Charter to protect the citizens of Glasgow from "unskilled and insufficient workmen, that had come to work at our Cathedral and other parts of the city". From that date to now, the Incorporation has strived to maintain the standard of skills of the associated crafts and to do charitable works. Since its origin Craft members have been closely involved with the buildings of a city whose Victorian heritage in particular is now ranked among the foremost in Europe. Whilst still very much associated with Glasgow's thriving building and architectural community, the Masons no longer of course exercise their medieval monopoly. The Incorporation presents prizes to students and awards an annual bursary to students and craftsmen and craftswomen and makes donations to worthy causes. The Incorporation has maintained its charitable work over the centuries. A significant group targeted for help are needy pensioners who traditionally are visited once a year by members of the Master Court. The Masons and the Wrights each have a Lady McDonald Fund which provides prizes each year for outstanding apprentices in the building trade. Along with the Incorporation of Wrights the Masons have traditionally been asked by the Trades House to provide two lyners to the Dean of Guild Court, originally to help with maintaining building standards, but now to assist in the administration of charitable funds. The Craft elects 4 members to the Trades House, while on the social side of its activities it maintains its age-old 'Pear Eating' evening, and like many crafts, holds an annual dinner as well. Participating in the traditional sporting competitions of angling, golf, bowls and curling is a popular hobby along with members of the other crafts. The Incorporation of Masons of Glasgow are very much part of the present and active in recruitment, the Masons number amongst their members the Prince of Wales. For those interested in the history of the Incorporation of Masons of Glasgow may be interested in reading "Sketch of the Incorporation of Masons" of Glasgow dated 1879 and compiled by James Cruickshank. "Glasgow, past and present, illustrated in Dean of Guild Court reports and in the reminiscences and communications of Senex, Aliquis, J.B., etc (1884)" Volume 1, Volume 2 and Volume 3 are excellent books for anyone wishing to know more about the Trades in Glasgow and the nIncorporation of Masons of Glasgow in particular. For a list of members of the Incorporation from 1574 to date, please click here. The books Burgesses and Guild Brethern from 1573 to 1750 and Burgesses and Guild Brethern from 1751 to 1846 are invaluable books for tracing anyone who became a burgess over the time frame specified. Both books have been digitised by the "Scottish Record Society.